Saturnia is a beautiful upscale community located in West Boca Raton just west of 441 and south of Yamato Road on Coral Ridge Drive. This gated neighborhood is encompassed with the typical tropical landscape that has come to define South Florida, making it a truly picturesque community to even just visit. Through the winding streets of Saturnia, you will notice lovely plantings, bike paths, nature trails, and perfectly manicured lawns. Developed in the late 1990's and early 2000's by GL Homes, Saturnia is comprised of 400 single family homes that offer 4 to 6 bedroom floor plans and range in size from 2,500 square feet to nearly 5,000 square feet. These intricately designed homes feature spectacular upgrades including gourmet kitchens, stainless steel appliances, custom cabinetry, crown molding throughout, oversized master suites, wood or marble flooring, circular driveways, large spacious patios, and private swimming pools overlooking breathtaking views of the shimmering lake or tropical vistas. Each home is uniquely created and features spectacular modern architecture. Homes for sale in Saturnia price from 500,000 to just over 750,000. 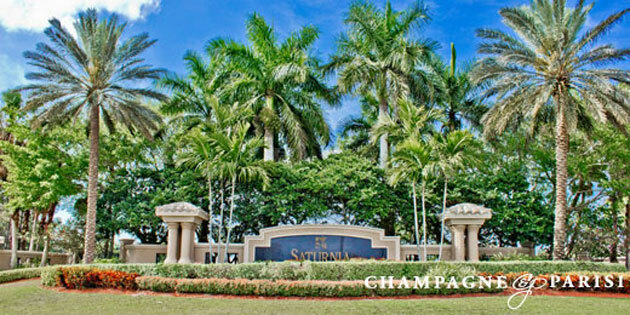 The Mediterranean inspired clubhouse at Saturnia offers sophistication and grandeur. This clubhouse features a multi-purpose room, state of the art fitness center, a resort-style swimming pool surrounded by an oversized sundeck, children's play area, and multiple clay tennis courts. South County Regional Public Park is in walking distance of Saturnia and offers its own list of exciting amenities. Saturnia is zoned for A-rated schools such as Sunrise Elementary, and Eagles landing that are both in walking distance of this unique community. Florida's Turnpike, 595 and The Sawgrass Expressway are all conveniently located close by for easy access to the surrounding cities. Saturnia is a compared to a tropical oasis of amazing wildlife, a gorgeous natural environment, and exquisite homes all just minutes from some of the best dining, shopping, and entertainment around!